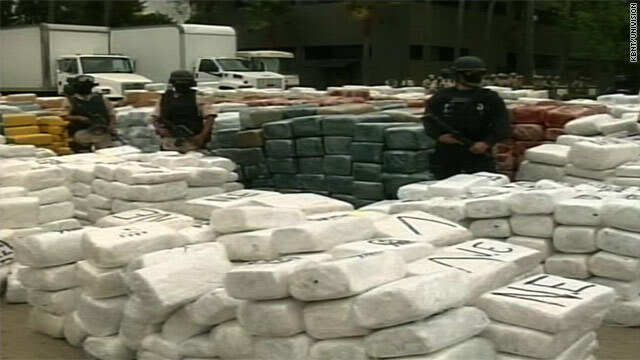 Authorities say this is the largest marijuana bust in Mexico in many years. (CNN) -- Authorities in the Mexican border city of Tijuana have seized 105 tons of marijuana, the largest bust in years, the state news agency reported Monday. Security forces encountered several vehicles suspected of carrying the drug early Monday morning, Notimex said. A clash ensued, the news agency reported, injuring two people -- a government agent and a suspected drug runner. Eleven people were detained, Notimex reported. The suspects then told agents where they could find more pot, the news agency said. Police seized 10,000 packages of marijuana that collectively weighed 105 tons. They also confiscated trailers, trucks and two large fire arms, Notimex reported. The agency said Monday's bust was the largest in the area. It is also the largest in Mexico in recent memory. More than 28,000 people have died in the country in drug-related violence since 2006, according to authorities. 1,195 topic views. 0 members, 1 guests and 6 web crawlers are browsing this forum.